Setting aside Harv's life of intrigue and adventure (with his sidekick Skippy/Manuel), I wanted to learn of his days as a professional athlete. Here's what I found, and how I found it. Harv came with JC papers and a tattoo. His racing name was Sotally Tober. Ugh. Anyway, his papers said he raced 7 times at Remington Park in Oklahoma, and he won one race. I contacted the Remington Park racetrack in the hopes of getting the winner's circle photo and video footage of his winning race. He was too old (records didn't go back that far), but their databases of photos and videos includes more than five years of races. Diane Evans' email in another issue. Diane was pleased to hear about Harv and she told me he had come to her as a four year old, from Virginia. "He steered like a Mack truck when we got him," she said. "But he came along nicely." She bought him from someone in Virginia, a dealer, but couldn't recall his name to verify what was on the JC papers. Owner #3: I googled the only other owner listed on Harv's papers, but he appeared to be incarcerated per a newspaper article I found. Didn't call him. Breeder: Harv's breeder was "Jim D. Day" of Arkansas, Rainbow Enterprises. Again, no luck there. Anyway, that's Harv's story. I think the search process will be unique to each horse, depending on paperwork and circumstances. The best leads are almost always from actual human beings, so glean everything you can from each person. I'm no racing expert so I may be missing obvious research sources in the world of racing. Feel free to jump in with additional suggestions! Interesting to hear of Harvey's past. I know my Chance's story, and most of Tucker's story, and Toby's story, all because I got them all at a very young age. 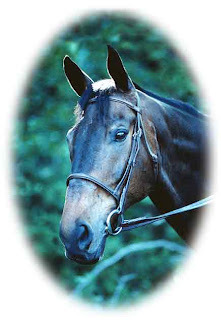 What I would have loved to have for them, and other horses I've owned are baby pictures, like the ones I have of Chance. It's kind of fun to see what he looked like as a foal and to see what he grew into. If your horse has been in the area a while, vets and farriers are also good sources of information. My vet has told me some horror stories about Drezden's younger days. Seems like the TB people are more helpful than the QH people. I've called the Jockey Club a few times, every time they've been helpful. But Huey, our first OTQH, we cannot trace. We can't read all the digits of his tattoo and he is a funny color (chestnut but looks bay). The QH racing people don't seem to want to deal with customers and just chase me off the phone every time. If anyone has any tips for OTQH tracing, I'm all ears. Our little painted pony came with a scrapbook of pictures from the moment he was born right up until we bought him (he was 4 years old), as well as pictures of his sire, dam, and full siblings. I don't have anything remotely like that for our other three, and I wish I could see them all from the beginning. Glad you found some history on the handsome Harv. Aw too bad you couldn't get his win photo and video!! That would have been the coolest thing. You did find out quite a bit tho, his daddy sure was perty! ok, that has to be the all time greatest racing name EVER!!!! hahaha seriously, I can't beleive that is real! I'm trying to get my guys history right now too, but I can't make out his tattoo at all..
My husband's family is from AR and, more specifically, North Little Rock. Rainbow Enterprise, INC was located there and ceased to exist in 1987. You may already know that. I'm asking around for you about Jim Day. They have High Tribute and he has some good solid names. A lot of European horses too. Looks like High Tribute had good bone and passed that on to his son! No, I didn't know that! Harv was born in 87. I think he is Jim D. Day to be more specific. What a small world, thanks so much Emily! I just want to thank you for your posts about TB's pasts...I had gotten bits and chunks along the way for my horse, but had given up on ever finding his win photo. Your post a few weeks back inspired me to start looking again. I was very lucky and the track my horse raced at has had the same photographers for 25 years now! In just over a week and 3 e-mails later I got my horses win photo in the mail today! On the Bit, congrats! I'd love to see that photo! Can we post it?